Traxxas captures the stunning beauty and speed of the Ford GT with this fully licensed replica body. High-performance street tires wrap around authentic dark chrome wheels for maximum effect. Replica brake discs with red calipers complete the scale look. We overlooked nothing to make sure the Traxxas Ford GT looks just as good as it drives. The Traxxas Ford GT rides on the 4-Tec 2.0 chassis for the ultimate in on-road driving performance. The all-new high-tech chassis keeps weight as low as possible for a crisp, responsive feel. The chassis' modular interlocking design allows easy maintenance while providing unprecedented stiffness and tight tolerances. A smooth under tray reduces drag and prevents snags on expansion joints and the finely tuned suspension keeps the wheels glued to the pavement for maximum road performance. Traxxas Stability Management keeps you in control without intruding on the fun. The Traxxas Ford GT lays down serious 30+ mph speed with the torquey Titan 12t motor driving all four wheels. Pioneered for the X-Maxx, the 4-Tec 2.0 chassis uses a fixed mounting system to set your gear mesh precisely every time. The waterproof XL-5 Electronic Speed Control provides ultra-smooth reliable power in real world conditions where rain, mud, and snow are possibilities. Need even more speed? It wouldn't be a Traxxas if it wasn't already built brushless -ready to handle extreme power upgrades. The Traxxas Ford GT rolls out of the box fully assembled and ready to race. Simply add a battery and charger and you're ready to go! (sold separately). The GT comes standard with a TQi 2.4GHz radio system with model memory and advanced tuning features. 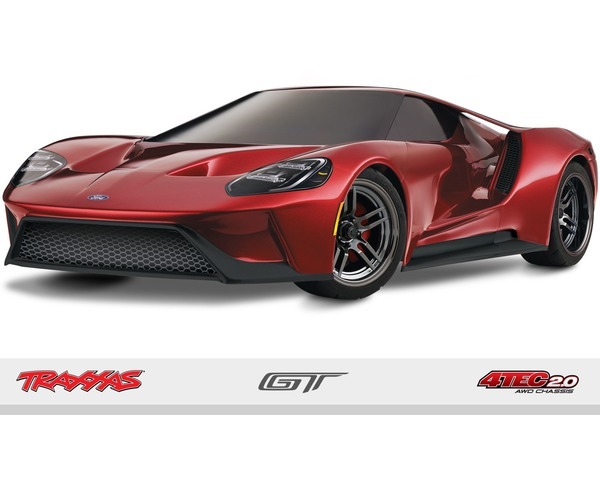 Like all Traxxas vehicles, the Traxxas Ford GT is backed by the best customer service in the industry.